Akbarzadeh, M., Esmaeili, M., Taleizadeh, A. (2015). EPQ model with scrap and backordering under Vendor managed inventory policy. 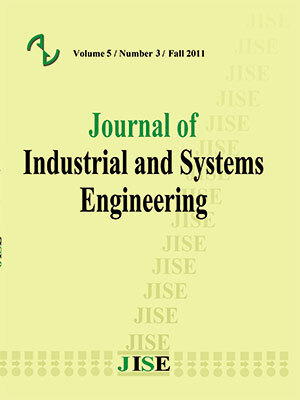 Journal of Industrial and Systems Engineering, 8(1), 85-102. Maryam Akbarzadeh; Maryam Esmaeili; Ata Allah Taleizadeh. "EPQ model with scrap and backordering under Vendor managed inventory policy". Journal of Industrial and Systems Engineering, 8, 1, 2015, 85-102. Akbarzadeh, M., Esmaeili, M., Taleizadeh, A. (2015). 'EPQ model with scrap and backordering under Vendor managed inventory policy', Journal of Industrial and Systems Engineering, 8(1), pp. 85-102. Akbarzadeh, M., Esmaeili, M., Taleizadeh, A. EPQ model with scrap and backordering under Vendor managed inventory policy. Journal of Industrial and Systems Engineering, 2015; 8(1): 85-102. This paper presents the economic production quantity (EPQ) models for the imperfect quality items produced with/without the presence of shortage condition. The models are presented in a two-level supply chain composed of a single manufacturer and a single buyer to investigate the performance of vendormanaged inventory (VMI) policy. The total costs are minimized to obtain the optimal production lot size and the allowable backorder level before and after applying VMI policy. Numerical examples and sensitivity analysis based on certain parameters are performed to show the capability of the proposed supply chain model enhanced with VMI policy. schemes: the role of vendor managed inventories.Management Science, 52, 1483–1492. Journal of Production Economics, 67, 201.
production system - a simple derivation.Computers & Industrial Engineering, 55,758–765. managed inventory systems.Management Science, 46, 217–232. multi-retailer supply chains. European Journal of Operational Research, 204(3),473-484.
shortages.International Journal of Production Economics, 106,544–549. imperfect item for vendor and buyer.Production Planning & Control,14,596–602. models with unequal shipment frequencies. Omega (Accepted). inspection errors, planned backorders, and sales returns.Comput. Ind. Eng, 64 (1), 389–402. modified EOQ model for imperfect quality items.Int. J. Prod. Econ., 132 (1), 1–12. with direct deliveries.Transportation Science, 36,94–118. using holding cost subsidies.Production and Operations Management, 17, 200–210. demand in an imperfect production system. J ManufactSyst, 32, 260–270. Journal of Advanced Manufacturing Technology ,49, 329–339. imperfect quality.International Journal of Production Economics, 64, 59–64. system.Appl. Math. Comput, 217 (13), 6159–6167. performance analysis. International Journal of Production Economics, 81–82,215–224. chain. Journal of Business Logistics, 20, 183–203. quality and shortage backordering.Omega, 35,7–11.